Lesbian Bed Death: LESBIAN BED DEATH present THE NIGHTMARE BEFORE CHRISTMAS FESTIVAL! 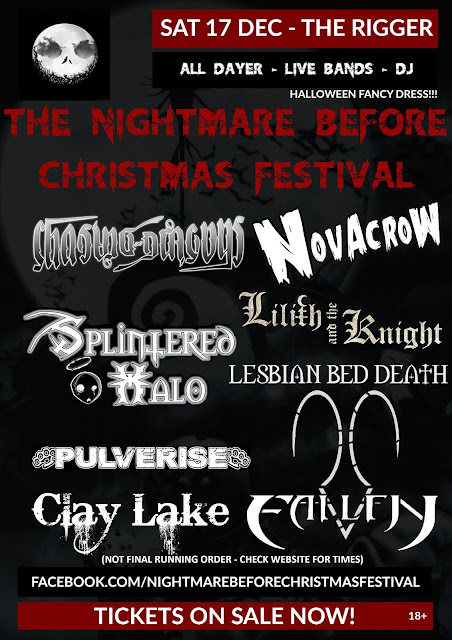 LESBIAN BED DEATH present THE NIGHTMARE BEFORE CHRISTMAS FESTIVAL! We're organising an all day festival at The Rigger, Newcastle-under-Lyme on Sat 17th December 2016. We have some amazing bands from across the UK joining us, and guitarist Mr Peach will be DJing until 2am. We're going to open the show at approx 3pm with a full headline set, and we're going to record it to. So, come down and join us for our last show of the year!